Stop waiting for inspiration to occur and take control – you can create the conditions that will reignite your inspiration and make work exciting again! Reignite your current job or learn what to look for in a job elsewhere. How you lost your inspiration in the first place (there are 9 forces quietly sucking the life out of your workdays) and why its reoccurence is so elusive. How to rekindle your inspiration – whether you’re wrestling with fear, disconnectedness, boredom, lack of confidence, lack of creative outlets, loss of control, feeling overwhelmed, feelings of insignificance, or other inspiration sapping causes. 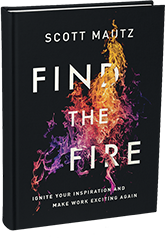 How to build a bonfire of inspiration using the insights, exercises, inspiring stories, checklists, case studies, advice, and more packed into this book. How to bring back that lovin’ feeling to your work! Valued at $19.99, yours free! My blog is filled with high value (not highly obvious) content on others-oriented leadership, meaning in and at work, motivation and inspiration how-to’s, success, personal development/productivity, culture, and entrepreneurship. What problems do you have in working, leading, and living fulfilled? What products could I develop to help? Call (513) 309-2919 or connect via email.